This morning in Hayward the temperature was a balmy above zero for once so I decided to go snowshoeing instead of hitting the gym. There has been a pair of snowshoes propped up in our cabin kitchen for a long time, mostly for decorative value, I figured, since they didn’t look like anything I’d seen in a store in the last 20 years or so. Doesn’t every cabin have a pair of these stuck on a wall somewhere, or wedged in a corner? Upon closer inspection, they appeared to be really ancient; worn out looking wood frames with leather lacings that sorely needed some saddle soap and TLC. 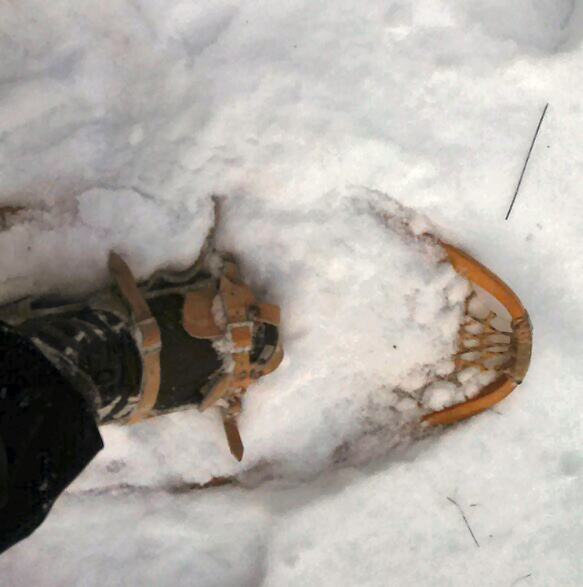 I wondered if the webbing would even hold my weight on the snow surface – I almost could picture my foot smashing through the whole contraption and sinking to the frozen ground, with the snowshoe frame hiked up around my knee. The tail alone, is impressively longer than most skis, well…..I’m exaggerating just a bit, but they are dangerously long. Time to go, and the dog has already decided she’s going to be a part of this adventure. Dolly is excitedly jumping up and down and barking in my face as I lean over to loosen the crusty leather straps and buckle my boots in. Of course, I left the ski poles back at the home in Mcfarland, so I’ll be freewheelin it today. What a beautiful day – the snow still covers most of the trees creating a very scenic view of the woods ahead of me. Dolly is bounding through the heavy snow well ahead of me, glancing back occasionally to make sure I am following the path she is choosing. We are clipping along at a pretty good pace and I can feel the blood coursing through my warmed up body, I feel energetic and euphoric. We were deep in the woods by now, surrounded by nature’s best ever views, always making a trek like this well worth the effort. But soon enough I realize my breathing had become quite loud with the heavy exertion, a passer-by could have thought I was a freight train right about then. I always overestimate my aerobic abilities-and this usually happens when I get far away from my home base. For a fleeting moment, I wondered if I could somehow call a cab to come get me. The deep snow took a toll on Dolly at about this same time also. 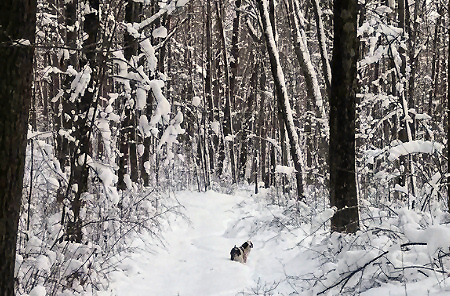 Now, instead of gleefully cavorting through the white stuff way ahead of me, she was behind me, taking advantage of the path my trudging made just for her. She didn’t even look like the dog I left the house with – she had an all-over covering of small snowballs hanging from her curly coat and her muzzle was powdery-white with iced whiskers sticker out all over- she looked like the Abominable Snowman. It only took a few words of encouragement, a wag of the tail, and we were off again. We wearily made it up the last hill (or mountain?) in the woods and the sight of the cabin in the distance welcomed us. With renewed vigor we forged onward through the knee-deep snow until we arrived at the front porch of our north woods home. Inside the warm cabin, Dolly promptly demanded a well-deserved dog treat, then curled up for a bit of a recuperative rest while I whisked the snow from the old leather bindings and unbuckled myself. A soothing cup of hot chocolate and life is good. What a magical walk through the woods this morning, well done, old snowshoes! This entry was posted in NORTHWOODS LIFE, Snowshoeing and tagged cathy lareau, Dolly, old snowshoes, Snowshoe, snowshoeing in Hayward wi, snowshoeing in northern wisconsin, springer spaniel, things to do in hayward wi, walk in the north woods of wi, winter in Hayward, winter recreation, wood snowshoes. Bookmark the permalink.